Oh, and my s/n is later 173xxx and i got the higher pressure relief valve. 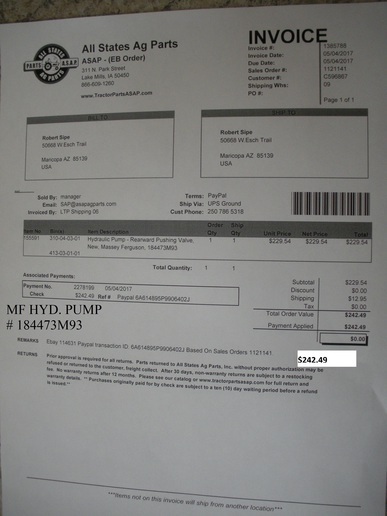 When I was in the same boat as you are......a first rate re-build kit with everything including the ex-mother in-laws Dentures was from $188.00>$206.00. I shall look into rebuilding the original, as I have neighbours with problematic Hydraulic PSI. I would take the splashing around the pump to indicate bad valves. How is the Back Lash on the Rear Drive Coupling? Hey Bob I received my pump this week and tried to install it for a little while last night. Is there any trick to shoe-horning the new pump into an older to35? Do you need to install the collar with the cotter pin on the forward pump shaft before you slide it down in or should you install it after? Do you tip the front in first or the back in first? Do you need to take the pressure relief valve or the control lever off before sliding the pump in? Any other advice?? Thanks!! 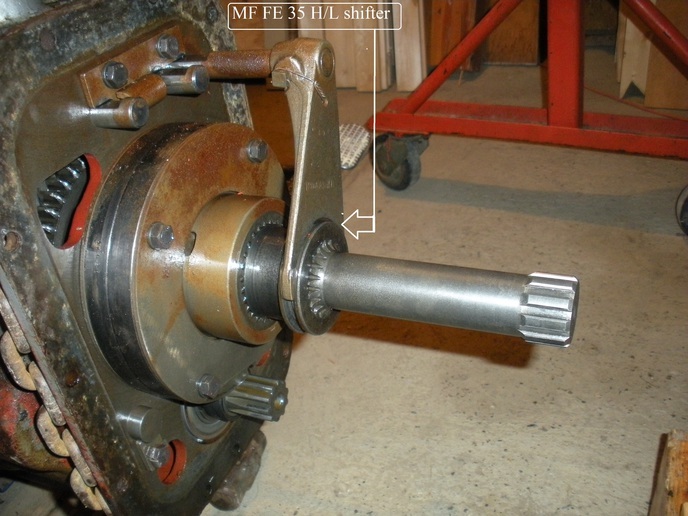 When I installed the NEW HYDRAULIC PUMP in my MF 35, I had to SPLIT / REMOVE the Transmission from the Diff. Housing,(SEE PICTURE) as I had a leaking GASKET between the AFT of the Transmission and the Diff. Housing to replace. I installed the HYD.PUMP into the Diff. Housing (Installed the TWO LOCATING DOWELS)with the Forward drive coupling attached to the HYDRAULIC PUMP with the cotter pin. 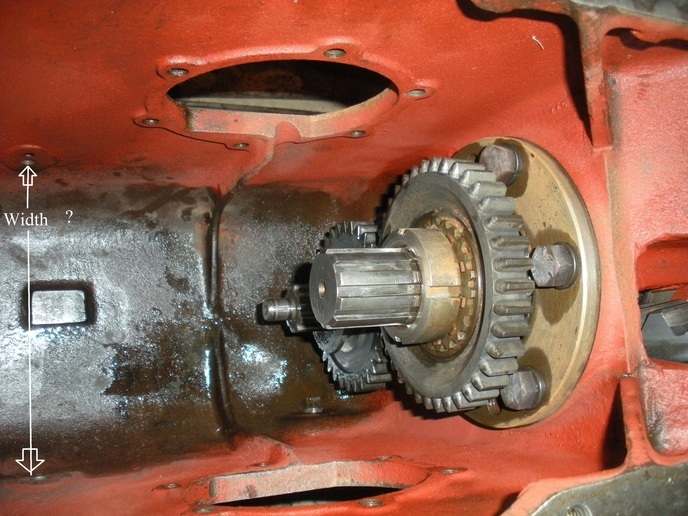 Then installed several Line-up Pins / Bolts to align the Transmission with the Diff. Housing, and checked that the OUT PUT SHAFT of the TRANMISSION would align with the COUPLING drive on the HYD. PUMP. With a helper we rolled the front half of the Tractor AFT, checked to verify that everything lined up properly. We then rolled the front half of the Tractor / Transmission forward, Installed a NEW GASKET, adhesive and matted the Transmission to the Diff. Housing. Secured all bolts between the Transmission and the Diff. Housing. The INPUT COUPLING drive of the HYDRAULIC PUMP did NOT align with the drive splines of the Transmission. 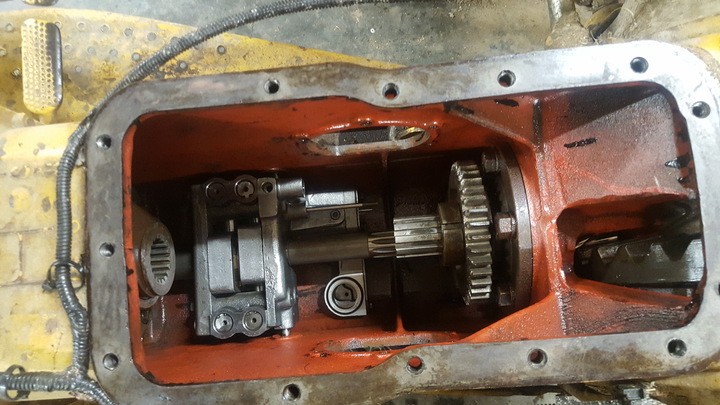 We engaged the drive GEAR on the PTO SHAFT forwards, engaging the PYO drive to the HYDRAULIC PUMP, then turned the PTO SHAFT. 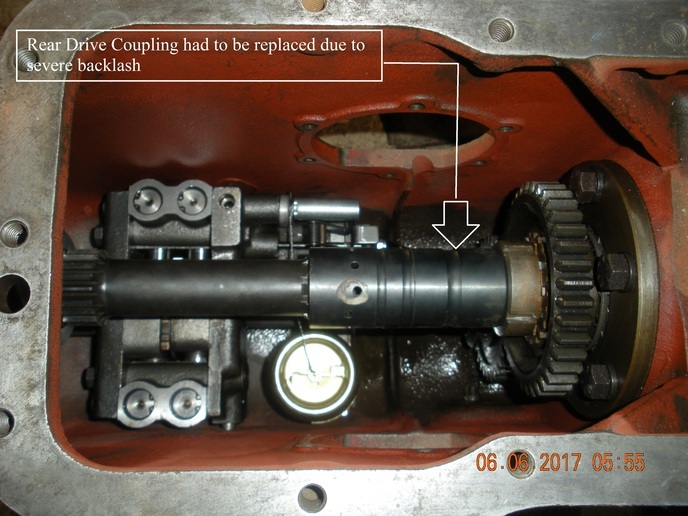 The result that the HYDRAULIC PUMP DRVIE COUPLING aligned properly with the out put drive of the Transmission. 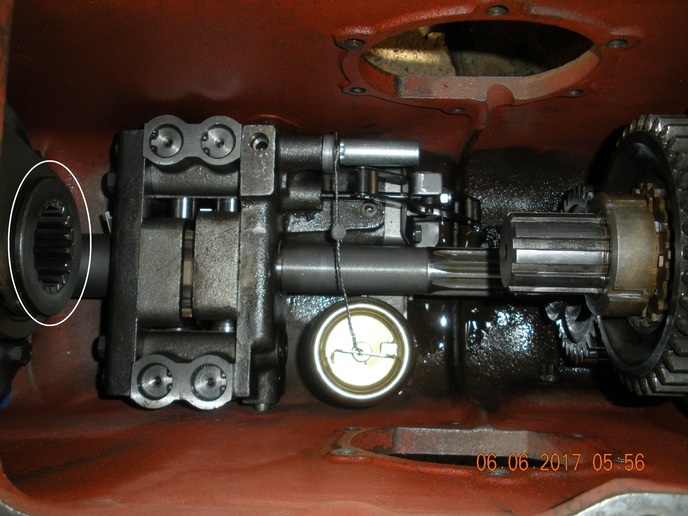 I have read in "YT" posts that YES it is possible to install the HYDRAULIC PUMP with out splitting the Transmission from the Diff. Housing on some Massey Models. 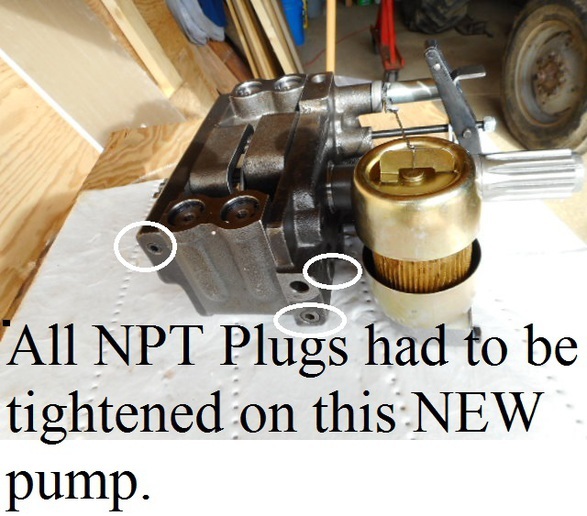 I have read in "YT" posts there are individual whom did not check all dimensions of the new PUMP against the OLD faulty pump, only to find the splines were DIFFERENT, as well as the width of the NEW PUMP was to wide to fit between the TWO mounting / securing Dowels. If I had to change out a PUMP with out splitting the transmission from the DIFF. Housing, I would remove what ever it takes to do the installation "short of NOT dismantling the PUMP HOUSING." Be sure the RANGE SELECTOR is in "H"....allows for more room to install the HYD.PUMP. Thanks for posting back ......always great to hear a success story. I would tackle that steady stream from the cylinder first, that could be the source of all your woes. Your tractor has the 3" piston and cylinder, right? 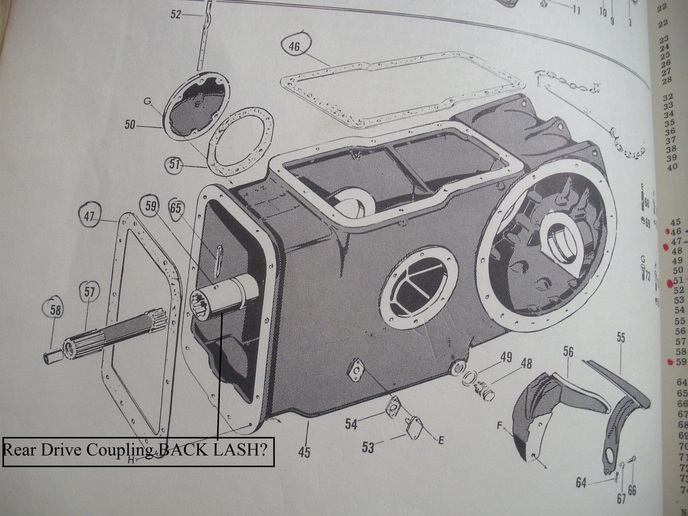 Did you say that the cylinder, piston, and rings are all new?